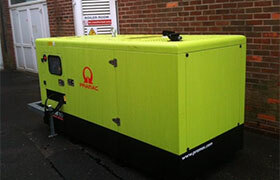 We recently installed a Pramac 80 KVA generator at Lulworth Camp, a British army base in Dorset. The camp is home to the Royal Armoured Corps Gunnery School and its 7,500 acre firing range is an important centre for training. With huge numbers of troops based at the barracks, it is important that things run smoothly when it comes to meal times. With tight routines and schedules, it is essential that the mess kitchens have a back up power supply in the event of a power cut. CES Electrical are used to fitting around the schedules and unique requirements of individual organisations and is something we do well. In the case of Lulworth Camp, we not only had to work to a tight deadline but also install out of hours. Moreover, we are also contracted to maintain the generator ongoing, in order to ensure that it is always in good working order should it be needed. “CES worked to a tight schedule and completed the works on time and to a high standard we would certainly recommend them for any further projects”.